Camayak Blog | How Much do Newsrooms Spend on Technology and Why? How Much do Newsrooms Spend on Technology and Why? Lofty comparisons for one of media’s stand-out success models that attracted 85 million unique visitors last month, and ones which frame a bottom-line concern for many publishers without access to venture capital investment: what do we spend our technology budget on and what are we hoping to get from it? We’ve seen publishers with a technology-centric approach contribute to some impressive headlines, before. In 2011, some commentators speculated that up to one-third of the $315 million that AOL paid to acquire Huffington Post was for the home-grown CMS that HuffPo had built themselves, primarily as part of a kind of technology arms race with others that might try to compete for HuffPo’s audience. More recently Forbes, under chief product officer Lewis Dvorkin have also been working on a content management system that now handles regular contributions from over 1,200 authors and is being mentioned in the same context as Gawker and Buzzfeed for its propensity to scavenge for increasing efficiency and benefits, one iteration after another, particularly with user-generated content. As open source frameworks and CMS like Drupal and WordPress have matured, smaller publishers like London’s Urban Times and Maine’s Bangor Daily News have also honed their own versions of their CMS, leveraging their comparatively lean technical staff to refine in-house processes that they can observe closely and try to optimize as cheaply as possible. For in-house solutions to compete with affordable off-the-shelf options, committing a healthy portion of your budget to staffing that objective in the first place is the most basic of requirements. Companies like Digital First Media and at the college level, news organizations such as the Daily Bruin at UCLA and Emerald Media Group at the University of Oregon are also looking to proprietary technology as a means of improving their product and bottom line. All continue to invest in building technology for their own use but are also keeping a close eye on their proofs-of-concept to identify where they may be stumbling on products or services that other businesses could use and even pay for. It sounds like a Silicon Valley – not a publishing – move, but one most brilliantly executed by Seattle-based Amazon – which did the same thing with their own Amazon Web Services infrastructure – and strategically by publishers like the New York Times. The Times, among others, has an impressive track record of sharing its own developments – like the ICE editor – with the open-source community, for business-orientated benefits ranging from goodwill to strategic reputation management. Buzzfeed meanwhile, says it won’t be turning its CMS into a separate revenue opportunity. This means the company doesn’t see an attractive enough business model in white-labeling the technology it considers such an integral part of its own value. Buzzfeed is rumored to have an impressively effective CMS, but without allowing other companies to put a version of the same technology to use, its self-drawn analogy to Apple doesn’t stretch far. Buzzfeed is investing this way to operate more efficiently and improve its own valuation, much like other successful web-publishers like Vice Media, who despite their prodigious web success are remarkably traditional publishers: producing desirable content at great volume and leveraging the attention it gains to sell corporate ‘creatives’ to advertisers. If you’re looking at your content-driven business horizon and want to see a glorious exit strategy (the kind that venture-backed media companies like Upworthy might be eyeing), then baking some solid technical architecture into your operation is probably wise. All the better if those decisions lead to lines of code or data points that can be generate value of their own, in the eyes of a prospective buyer. 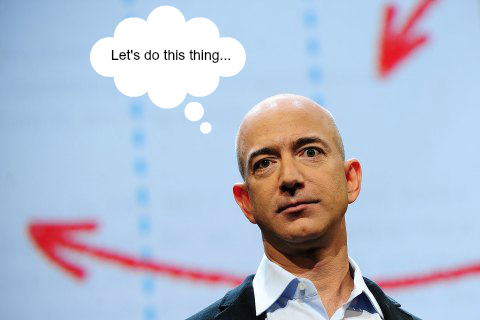 Enter Jeff Bezos, whose recent acquisition of the Washington Post is sure to produce some technology-powered pivots and revelations in how WaPo develops its audience to the profit of its business (and content, of course). Bezos might not have an exit strategy in mind, but will certainly use his experience at Amazon to have WaPo technology investments pay off in both the near and long-term: efficiency to minimize waste, plus insights that will only start paying off once there’s enough data to educate editorial and business decisions, the separation of which one would imagine under a fully sustainable model wouldn’t be so forced apart as they traditionally have been. But what if you don’t want to sell your publishing business, or try to find, develop and support services that you can sell to others? What if your goals as a publisher are already well met by cost-effective, first-class tools and your relationship with some of your third party suppliers is even good enough that you can influence their product development? Do you need to develop your own technology at all? Perhaps, as London’s Tech City News editor Alex Wood explains in an upcoming interview in our #WTOT magazine (available at all good college and professional media conventions next month), you don’t need proprietary technology to harvest valuable data for your business: just a clever application of what’s readily available for free or very little outlay. Simply put: the more resourceful you are as a publisher, the less bandwidth you may have for speculative technology investments that could appear high in excitement but low on tangible returns. The main obstacles to publishers successfully building their own, re-usable technology on other hand, are tricky questions like: what do we want? What does our readership and staff want? Is anybody sticking around long enough to make that happen? Ultimately, the most rewarding technology investment is an appropriate use of the budget at your disposal yielding the maximum returns. Deciding how to qualify those returns too, is critical in avoiding the kind of arbitrary box-checking that also blights other areas of tool-selection in media and for that, you need clear goals. Once those are defined, most publishers can find plenty of tools that will help them identify where and why they want to invest in specific outsourced services and whether they stand to gain from investing in their own technology, too. Camayak is a newsroom collaboration system that allows editors to organize their staff and content production, particularly when people are working remotely. Most of the newsrooms we work with previously used some combination of Google Docs, Dropbox, whiteboards and email attachments, which fragmented the efforts their staff were putting in to produce their content. By contrast, Camayak backs-up all this collaboration in one place and streamlines the process of assigning work, creating editorial workflows, tracking revisions, building staff profiles, receiving new pitch ideas, organizing photography and publishing directly to any WordPress site(s). Here’s a video summarizing these features (and introducing some of our team). We started working with community colleges in California, who were looking for a better way to keep all their students in the loop when they were out of class. After we released a cartoon explaining the basic premise behind what we did, we got inundated with requests from high schools, professional agencies and college newsrooms looking for the same tools. We’re working on a number of exciting projects and have some significant feature releases planned between now and the end of the year. For comments and questions, email the author at roman@camayak.com. Roman Heindorff is a co-founder and CEO at Camayak.